Perfect For: Big Groups Birthdays Happy Hour Late Night Eats Outdoor/Patio Situation Quick Eats Sports! A lot about the Avenue C landscape has changed since we first reviewed Royale way back in 2009. Back then, Royale, Esperanto, and The Sunburnt Cow were the only games in town on Loisaida Ave. (Pour some out for the Sunburnt Cow, by the way, we had some great times there in our early 20s.) These days, Avenue C is stocked with and has become one of lower Manhattan’s premiere eating and drinking destinations. One thing that hasn’t changed? The fact that there is no better place to get a burger and soak in some sun than on the back patio at Royale. For the last decade, Royale has had one of the best burgers in Alphabet City. It’s not fancy, or made with brand-name meat, but it’s tried and true, both consistent and affordable. From the street, Royale doesn’t look like much, so it’s the kind of place you either know about or you don’t. And if you don’t know, now you know. We generally reserve Royale for day drinking, or when we want to watch sports on TV at a place that doesn’t get overly rowdy. On second thought, maybe not that much has changed on Avenue C. There are just a lot more options around these parts now. Don’t forget about Royale. Soft bun, medium-sized patty, griddled to perfection. There are no frills to this burger. It’s straightforward and delicious. Same thing as above, just add bacon. Obviously, add bacon. They have burgers for vegetarians as well. I love onion rings. Like, a lot. I take them very seriously. These are good onion rings. Huge, fried, crispy rings of heaven. Order them. Full spread must include fries. Come on. 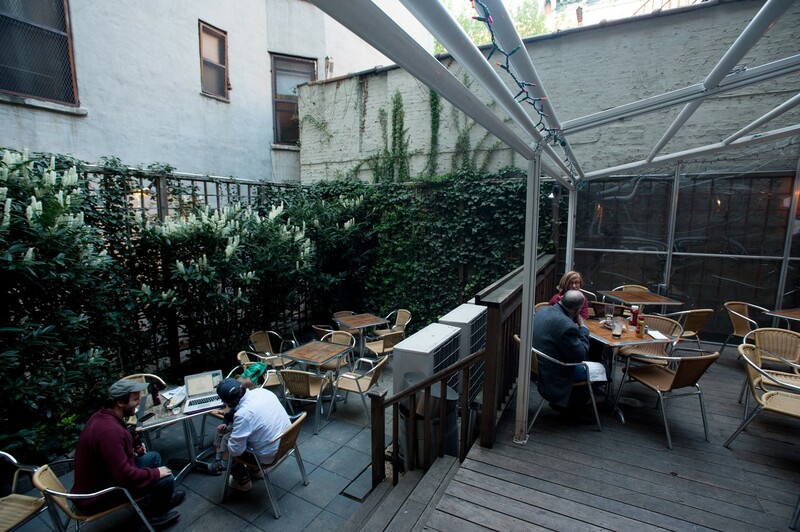 Treadwell Park is an indoor beer garden on the Upper East Side with games and enough space for a big group. Lot 45 is a big warehouse bar in Bushwick where people come to dance when they don’t want to schlep to Manhattan for a rowdy DJ situation.